We stock a range of cards from Red River Paper, Museo and Moab Paper. 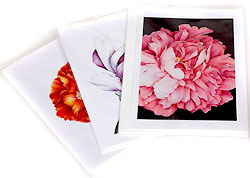 These products are premium photo quality inkjet papers that are pre-cut to popular greeting and note card sizes. They are inkjet printable on one or both sides (see product description). The cards are mechanically pre-scored for easy and professional looking folds. Order matching envelopes for inkjet printable greeting cards for a complete card presentation.